Human Bronchial Epithelial Cells (HBEpC) provide an excellent model system to study all aspects of epithelial function and disease, particularly those related to airway viral infections, as well as tissue repair mechanisms, signaling changes and potential treatments relevant to lung injuries, mechanical and oxidative stress, inflammation, pulmonary diseases and smoking. When grown on inserts and provided with the liquid/air interface, HBEpC can differentiate into a pseudostriated epithelium and serve as a more physiological 3D tissue model for in vitro studies. 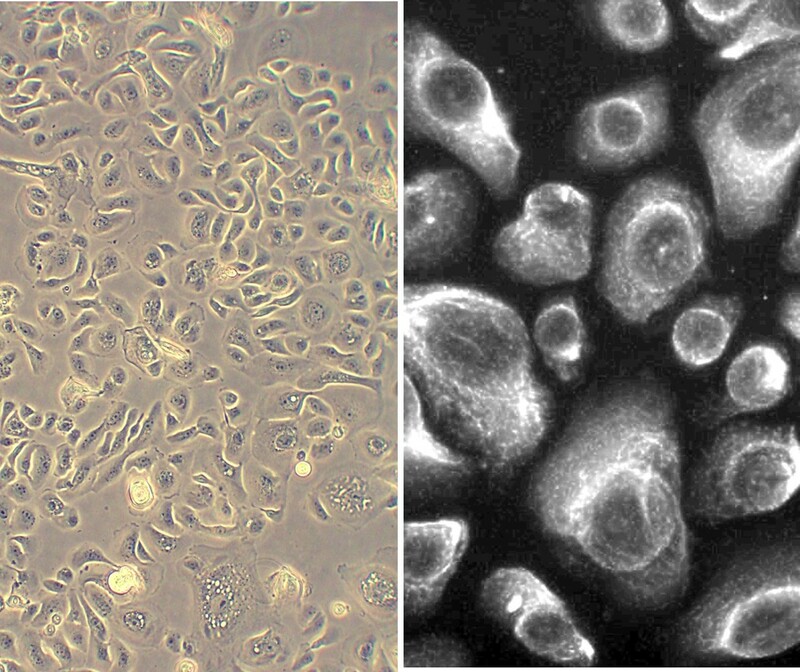 The HBEpC shown here were cultured (L) and immunolabeled for cytokeratin 18 (R). Activation, expression and production of genes, kinases and signaling pathways by cytokines, growth factors, interleukins, binding proteins and pro-inflammatory molecules. Stimulation-dependent, observable changes in proliferation, bronchial epithelial permeability, crosslinking of membrane glycoproteins and cell surface adhesion molecules. Drug discovery cell screening for in vitro assay of compounds, or to extend and confirm high-throughput work done in cell lines. Clinical focused discoveries leveraging HBEpC include therapeutics to suppress tumor gene transcription, apoptosis, inflammation, auto-immune disease and viral infection, while enhancing cell protection, repair and lifespan. (Click to Enlarge) Human Bronchial Epithelial Cell (HBEpC)-based 3D airway tissue model, showing Millipore Insert, day 14 (A). 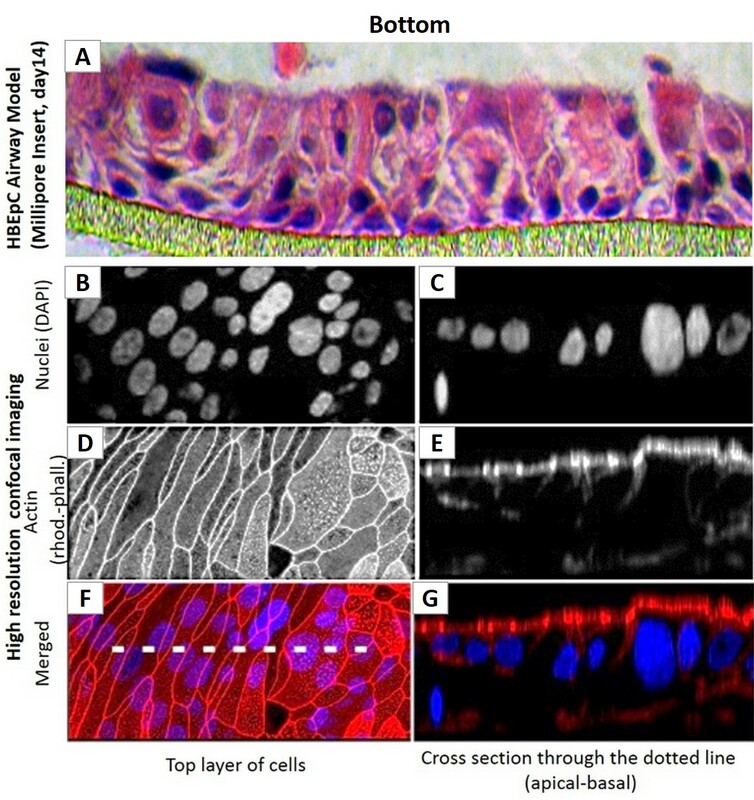 High resolution confocal imaging (B–G) of the top cell layer (B,D,F) or a cross section (C,E,G). DAPI-labeled Nuclei (B&C), rhod-phall-labeled Actin (D&E) and merged images (F&G). Hiraku, Y., F. Guo, N. Ma, T. Yamada, S. Wang, S. Kawanishi and M. Murata. 2016. Multi-walled carbon nanotube induces nitrative DNA damage in human lung epithelial cells via HMGB1-RAGE interaction and Toll-like receptor 9 activation. Particle & Fibre Toxicol, 13:16. Mungunsukh, O., Y. Lee, D. Bottaro and R. Day. 2016. The Hepatocyte Growth Factor Isoform NK2 Activates Motogenesis and Survival but not Proliferation due to Lack of Akt Activation. Cellular Signaling, 28:1114-1123. Othumpangat, S., J. Noti, C. McMillen and D. Beezhold. 2016. ICAM-1 regulates the survival of influenza virus in lung epithelial cells during the early stages of infection. Virology, 487:85-94. Perez, D. and H. Chen. 2016. Methods and Compositions for in vivo Immune Stimulation and Antigen Production. Patent Application US 20160022807 A1. Burns, T., A. Ali, and D. Matesic. 2015. Comparative Effects of 4-Phenyl-3-Butenoic Acid and Vorinostat on Cell Growth and Signaling. Anticancer Research, 35: 775-784. Li, J., J. Guan X. Long and X. Xiang. 2015. Endothelin-1 Upregulates the Expression of High Mobility Group Box 1 in Human Bronchial Epithelial Cells. Pharmacology, 96:144-150. Othumpangat, S., J. Noti, C. McMillen, and D. Beezhold. 2015. ICAM-1 regulates the survival of influenza virus in lung epithelial cells during the early stages of infection. Virology, 487:85-94. Chen, H., M. Angel, W. Li, C. Finch, A. Gonzalez, T. Sutton, J. Santos, and D. Perez. 2014. All-inOne Bacmids: an Efficient Reverse Genetics Strategy for Influenza A Virus Vaccines. J Virol, 88:10013-10025. Chen, H., M. Angel, W. Li, C. Finch, A. Gonzalez, T. Sutton, J. Santos, and D. Perez. 2014. All-in-One Bacmids: an Efficient Reverse. J Virol, 88:10013. Fischer, D., R. Janssen, M. Roseboom, A. Scaffidi, and M. Tessari. 2014. Methods for identifying and compounds useful for increasing the functional activity and cell surface expression of CF-associated mutant cystic fibrosis transmembrane conductance regulator. Patent US 8765376 B2. Haselmayer, P., M. Camps, M. Muzerelle, S. El_bawab, C. Waltzinger, L. Bruns, N. Abla, M. Polokoff, C. Jond-necand, and M. Gaudet. 2014. Characterization of novel PI3Kδ inhibitors as potential therapeutics for SLE and lupus nephritis in pre-clinical studies. Name: Frontiers in Immunology. 5:233. Gaillard, and H. Ji. 2014. Characterization of novel PI3Kδ inhibitors as potential therapeutics for SLE and lupus nephritis in pre-clinical studies. Front Immunol, 5:233. Nasreen, N., L. Gonzalves, S. Peruvemba and K. Mohammed. 2014. Fluticasone furoate is more effective than mometasone furoate in restoring tobacco smoke inhibited SOCS-3 expression in airway epithelial cells. Intl Immunopharmacol, 19:153-160. Prakash, S., S. Agrawal, H. Vahed, M. Ngyuen, L. BenMohamad, S. Gupta and A. Agrawal. 2014. Dendritic cells from aged subjects contribute to chronic airway inflammation by activating bronchial epithelial cells under steady state. Mucosal Immunol, 7:1386-1394. Tripathi, B., X. Qian, P. Mertins, D. Wang, A. Papageorge, S. Carr, and D. Lowy. 2014. CDK5 is a major regulator of the tumor suppressor DLC1. JCB, 207:627-642. Voiles, L., D. Lewis, L. Han, I. Lupov, T. Lin, M. Robertson, I. Petrache and H. Chang. 2014. Overexpression of type VI collagen in neoplastic lung tissues. Oncology Reports, 32:1897-1904. Abdullah, L., C. Wolber, M. Kesimer, J. Sheehan, and C.W. Davis. 2012. Studying Mucin Secretion from Human Bronchial Epithelial Cell Primary Cultures. In Mucins. Vol. 842. M.A. McGuckin and D.J. Thornton, editors. Humana Press. 259-277. Narisawa-Saito, M., Y. Inagawa, Y. Yoshimatsu, K. Haga, K. Tanaka, N. Egawa, S. Ohno, H. Ichikawa, T. Yugawa, M. Fujita and T. Kiyono. 2012. A critical role of MYC for transformation of human cells by HPV16 E6E7 and oncogenic HRAS. Carcinogenesis, 33:910-917. Nasreen, N., N. Khodayari, B. Sukka-Ganesh, S. Peruvemba, and K.A. Mohammed. 2012. Fluticasone propionate and Salmeterol combination induces SOCS-3 expression in airway epithelial cells. International Immunopharmacology. 12:217-225. Othumpangat, S., M. Regier and G. Piedimonte. 2012. Nerve growth factor modulates human rhinovirus infection in airway epithelial cells by controlling ICAM-1 expression. Am J. Physiol – Lung Cellular & Molec Physiol, 302:L1057-L1066. Othumpangat, S., C. Walton, and G. Piedimonte. 2012b. MicroRNA-221 Modulates RSV Replication in Human Bronchial Epithelium by Targeting NGF Expression. PloS one. 7:e30030. Berg, E.L., J. Yang, J. Melrose, D. Nguyen, S. Privat, E. Rosler, E.J. Kunkel, and S. Ekins. 2010. Chemical target and pathway toxicity mechanisms defined in primary human cell systems. Journal of Pharmacological and Toxicological Methods. 61:3-15. Lung, J., K.-J. Liu, J.-Y. Chang, S.-J. Leu, and N.-Y. Shih. 2010. MBP-1 is efficiently encoded by an alternative transcript of the ENO1 gene but post-translationally regulated by proteasome-dependent protein turnover. FEBS Journal. 277:4308-4321. Maier, K.G., X. Han, B. Sadowitz, K.L. Gentile, F.A. Middleton, and V. Gahtan. 2010. Thrombospondin-1: a proatherosclerotic protein augmented by hyperglycemia. Journal of Vascular Surgery. 51:1238-1247. Mungunsukh, O., A.J. Griffin, Y.H. Lee, and R.M. Day. 2010. Bleomycin induces the extrinsic apoptotic pathway in pulmonary endothelial cells. American Journal of Physiology - Lung Cellular and Molecular Physiology. 298:L696-L703. Tai, H.Y., M.F. Tam, H. Chou, D.W. Perng, and H.D. Shen. 2010. Pen ch 13 Major Fungal Allergen Decreases CD44 Expression in Human Bronchial Epithelial Cells. International Archives of Allergy and Immunology. 153:367-371. Houck, K.A., D.J. Dix, R.S. Judson, R.J. Kavlock, J. Yang, and E.L. Berg. 2009. Profiling Bioactivity of the ToxCast Chemical Library Using BioMAP Primary Human Cell Systems. Journal of biomolecular screening. 14:1054-1066. Schembri, F., S. Sridhar, C. Perdomo, A.M. Gustafson, X. Zhang, A. Ergun, J. Lu, G. Liu, X. Zhang, J. Bowers, C. Vaziri, K. Ott, K. Sensinger, J.J. Collins, J.S. Brody, R. Getts, M.E. Lenburg, and A. Spira. 2009. MicroRNAs as modulators of smoking-induced gene expression changes in human airway epithelium. PNAS. doi: 10.1073/pnas.0806383106. Song, H., H. Wan, Y. Araya, and D. Perez. 2009. Partial direct contact transmission in ferrets of a mallard H7N3 influenza virus with typical avian-like receptor specificity. Virology Journal. 6:126. Tanaka, H., T. Fukushima, K. Yorita, M. Kawaguchi, and H. Kataoka. 2009. Tissue injury alters the site of expression of hepatocyte growth factor activator inhibitor type 1 in bronchial epithelial cells. Human Cell. 22:11-17. Tumpey, and F. Fang. 2009. Novel Pandemic Influenza A(H1N1) Viruses Are Potently Inhibited by DAS181, a Sialidase Fusion Protein. PloS one. 4:e7788. Lee, Y.H., O. Mungunsukh, R.L. Tutino, A.P. Marquez, and R.M. Day. 2010. Angiotensin-II-induced apoptosis requires regulation of nucleolin and Bcl-xL by SHP-2 in primary lung endothelial cells. Journal of cell science. 123:1634-1643. Lee, Y.H., Y.J. Suzuki, A.J. Griffin, and R.M. Day. 2008. Hepatocyte growth factor regulates cyclooxygenase-2 expression via β-catenin, Akt, and p42/p44 MAPK in human bronchial epithelial cells. American Journal of Physiology. 294:L778-L786. Haga, K., S.-i. Ohno, T. Yugawa, M. Narisawa-Saito, M. Fujita, M. Sakamoto, D.A. Galloway, and T. Kiyono. 2007. Efficient immortalization of primary human cells by p16INK4a-specific short hairpin RNA or Bmi-1, combined with introduction of hTERT. Cancer science. 98:147-154. Handa, K., T. Yugawa, M. Narisawa-Saito, S.-i. Ohno, M. Fujita, and T. Kiyono. 2007. E6AP-Dependent Degradation of DLG4/PSD95 by High-Risk Human Papillomavirus Type 18 E6 Protein. Journal of Virology. 81:1379-1389. Horvath, G., E.S. Mendes, N. Schmid, A. Schmid, G.E. Conner, M. Salathe, and A. Wanner. 2007. The effect of corticosteroids on the disposal of long-acting β2-agonists by airway smooth muscle cells. Journal of Allergy and Clinical Immunology. 120:1103-1109. Tai, H., M. Tam, H. Chou, H. Peng, S. Su, D. Perng, and H. Shen. 2006. Pen ch 13 allergen induces secretion of mediators and degradation of occludin protein of human lung epithelial cells. 61:382-388. Lee, S.C., J.Y. Hsu, L.S. Fu, J.J. Chu, S.J. Fan, and C.S. Chi. 2005. Comparison of the activities of granulocyte-macrophage colony-stimulating factor and interleukin-8 secretion between two lung epithelial cell lines. J. microbial., immunol.& infection. 38:327-331. Look, D.C., L.L. Stoll, S.A. Romig, A. Humlicek, B.E. Britigan, and G.M. Denning. 2005. Pyocyanin and Its Precursor Phenazine-1-Carboxylic Acid Increase IL-8 and Intercellular Adhesion Molecule-1 Expression in Human Airway Epithelial Cells by Oxidant-Dependent Mechanisms. The Journal of Immunology. 175:4017-4023. Kilani, M., K. Mohammed, N. Nasreen, R. Tepper, and V. Antony. 2004a. RSV Causes HIF-1α Stabilization via NO Release in Primary Bronchial Epithelial Cells. Inflammation. 28:245-251. Kilani, M.M., K.A. Mohammed, N. Nasreen, J.A. Hardwick, M.H. Kaplan, R.S. Tepper, and V.B. Antony. 2004b. Respiratory syncytial virus causes increased bronchial epithelial permeability*. CHEST Journal. 126:186-191. O'Malley, Y.Q., K.J. Reszka, G.T. Rasmussen, M.Y. Abdalla, G.M. Denning, and B.E. Britigan. 2003. The Pseudomonas secretory product pyocyanin inhibits catalase activity in human lung epithelial cells. American Journal of Physiology. 285:L1077-L1086.